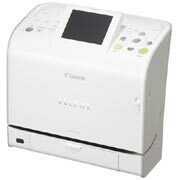 Canon U.S.A. introduced the Selphy ES2 Compact Photo Printer. The printer features “Easy Photo Pack” cartridges that combine ink and paper. It uses USB 2.0 to connect to a Mac or PC and also supports direct connections to PictBridge-enabled cameras. The Selphy ES2 also automatically corrects for red-eye and enhances images for exposure, color and brightness. The Selphy ES2 sports a 3.0-inch “tilt-up” TFT display that delivers detailed previews of your images before printing. The printer produces from credit card size up to 4 x 6-inch prints at 300 x 300 dots per inch that are water-resistant and can resist fading up to 100 years. Canon Selphy ES2 employs Canon’s proprietary Easy-Scroll Wheel, a navigation tool that lets you quickly browse and use the functions you want. The device also features built-in memory card readers that work with most commonly used memory cards in digital cameras including CompactFlash, Memory Sticks, MMC, SD Card, SDHC and others. The printer is coming in October and will cost $199.99. This entry was posted on Thursday, September 27th, 2007 at 3:23 am	and is filed under Canon, photo, printer. "Merits And Flaws Of Printer Cartridges"
"10 Reasons Not To Shop with Toner Cartridge Depot"